We don't quite understand why it's dubbed the "forbidden rice", for black rice should certainly not be forbidden from your diet due to its impressive health benefits, powerful disease-fighting antioxidants and high fiber content! Black rice, also known (more suitably) as Longevity Rice, used to be consumed in regions of Asia for thousands of years, and was in fact reserved for only Chinese royalty. 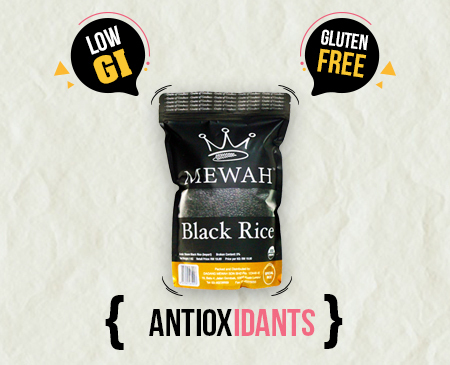 Now it's available to you and your family in the form of MEWAH's imported USDA-Certified Black Rice, brimming with natural whole grain goodness for those who know how to appreciate the finest rice quality for good health!